Elaine Owen first fell in love with Jane Austen as a young teenager. She read Pride & Prejudice for the first time in the summer between eighth and ninth grades, and while other kids were giving book reports on things like The Hardy Boys and the Mystery of The Ticking Clock, she was describing the ways that character faults are explored in Jane Austen’s classic. Although her English teacher was vastly entertained, it is possible that her classmates viewed her as a cross between Mary Bennet and Lady Catherine. Elaine eventually discovered Jane Austen fan fiction books in her local bookstore and spent lots of money she did not have in order to devour them all. When her credit cards were maxed out and store clerks said she really had to leave, she became desperate and discovered fan fiction sites online. Around this time her therapist suggested that she find some kind of creative outlet for herself. Elaine took a deep breath, swallowed nervously, and wrote down the first chapter of what eventually became her first book, Mr. Darcy’s Persistent Pursuit. 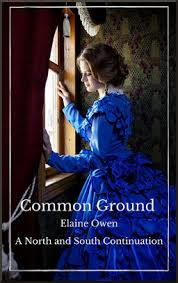 And this year, she published Common Ground her first North and South variation book, making her one of the few authors writing fan fiction for my favorite novels: Pride and Prejudice and North and South. With this background I obviously had to invite her to visit my blog. She happily agreed to concede me an interview, and I hope you all enjoy getting to know Mrs. Owen and her work as much as I did. First of all let me thank you for taking the time to visit From Pemberley to Milton Mrs. Owen. It is a pleasure to have you here! Your first published book was Mr. Darcy’s Persistent Pursuit, and after that one, JAFF books followed. Why did you decide to write a North and South fan fiction book? At some point last fall I noticed N&S referenced again and again on the various JAFF boards, and I finally decided to see what all the fuss was about. So I downloaded the book and started reading that, and I was about halfway through when I watched the movie. I was hooked! Who wouldn’t be, after both of *those* experiences? So then I just wrote a one-shot with my idea of what might have happened on the train ride back to Milton after that famous kiss. I only meant for it to be that one chapter, but the reaction I received convinced me to continue the story, and things just went from there. Why did you choose to write a sequel and not a variation? That was just where the story seemed to lead me, since I had started on the train platform. Many authors choose to begin their sequels after the train station scene created by BBC and not the original ending scene in the book. Do you believe the BBC adaptation is crucial to the success of the story? Or would Gaskell’s work have the same effect on the public without the wonderful Richard Armitage performance? No, I don’t think it would have. Gaskell’s book is easier for modern readers to absorb than Pride and Prejudice, but it is still fairly dry by today’s standards. The movie version is much more for modern audiences, and it helps that the movie was done so well. In North and South Gaskell explores the workers difficulties and struggles. In Common Ground you choose to explore the difficulties faced by the masters. Would you like to tell us more about that? Again, this story was inspired by the train platform scene, so automatically it was told from Thornton and Margaret’s viewpoint. That meant that the story would be more about their struggles together, which then put more focus on Thornton as a master and the difficulties he faced. However, in the end it becomes apparent that the fates of the masters and the workers are inextricably tied together, and they all profit when they learn to work together. I hope Gaskell would approve. I am sure she would. North and South was much more than a romance and the social struggles played a big part on her writing. It is not common to see fan fiction who also delves on that, however, you did it in your book. In fact, in Common Ground you clearly explain what was the speculation in which Watson entered. Where did you come up with this specific idea? There was a story I had read some years ago which had the same basic idea– basing the possibility of profit on a specific event in a foreign country. (No spoilers here! 🙂 ) The idea sounds horrifying to us today for moral reasons, as well as for the risk involved, but banks were not regulated then like they are now, and things like this *did* happen. The novelty of the idea stuck in my head, so I adapted it for my own use. I wish I could remember the exact book or author. This book was released as part of the Margaret of Milton series, does that mean we are to expect another North and South book? Yes. I am still working on a Darcy and Elizabeth story, tentatively titled Duty Demands, and then I will finish up my Longbourn Unexpected series. After that I would like to write in detail about the first ten years of the Thornton’s marriage, and possibly also base a story on the character of Nicholas Higgins. Who wouldn’t want to see more of Higgins? I know I would! And I often wonder what would have happened to Higgins if Bessy didn’t die. Is there hope for a variation where she does not die? I haven’t really thought about it, but that sounds like an excellent idea!!! The number of writers who started with JAFF but are now also writing about North and South is increasing, do you believe we will start to see a boom of North and South fan fiction? Do you believe it will ever get to the proportions of Pride and Prejudice fan fic? I hope to see it increase, as the dramatic possibilities are endless. But for it to swell to the almost cult-like devotion of Pride and Prejudice proportions is probably a number of years in the future. But that’s good news—we have years and years of Thornton and Margaret ahead of us! Once again I would like to thank Mrs. Owen for her availability to chat a little bit with me. I hope you have all enjoyed the interview and if you are curious about Common Ground you can always see the review I posted last week. Thank you, Rita, for taking the time to introduce my book on your blog. Also I really appreciate the thoughtful questions you put together. It has been a pleasure to “speak” with you, and I look forward to following From Pemberley to Milton for myself! Great interview, Rita. It was nice getting to know you, Elaine Owens. I am always wanting more N&S books so glad to know of yours. I did read Rita’s excellent review earlier. Thanks again to both of you, and best wishes on the success of your book, Ms. Owens. Thank you, Janet! I hope you read it and enjoy it. Elaine, I am still laughing about the image of you getting booted out of the bookstore! I loved Common Ground. Good to see more N&S books coming out to feed the addiction! I’m glad you liked it. Hopefully there will be other authors writing even more N&S fan fiction in the future! That was a hilarious intro maybe because there is some truth in it for all us booklovers. 🙂 Oh, new to me author and books so I am glad for the interview and introduction. It’s a pleasure to be introduced to you, too, Sophia! I’m sure we all appreciate that therapist advising Elaine on another creative outlet for herself,or we would not be here today happily discussing the fruits of her labour. Haven’t read Common Ground yet,but i’d definitely like to find out what happened after that kiss!! And to think that we might have other books to look forward to in the future, probably based on the early years of the Thorntons” marriage…….more N&S variations!!!! Fantastic! Great interview,Rita. It’s really interesting to read about sn author’s background and put a face to the name. Thanks! I hope you read it and enjoy it! As for my therapist– she gets a free copy of every book I write, forever! Thanks Jen! You are an immensely talented writer yourself! Anyone who hasn’t checked out Darcy’s Melody yet is really missing out! Lovely interview! It’s nice that another writer is writing North and South FF. Best wishes with the book, it was really nice to meet Elaine. Hopefully more authors will join this charming FF world! Thank you, JustJane! I agree!! You’re welcome and good luck with the book. An excellent interview, Rita. Elaine’s book One False Step is in my opinion one of the best JAFF stories ever written (as I wrote in my amazon review under the name Opisica). I recently received a copy of Mr. Darcy’s Persistent Pursuit and am so looking forward to reading it. But North and South leaves me cold. I don’t know why — perhaps because of the brutal opening scene in the movie, perhaps because I don’t find the characters very sympathetic, perhaps because I don’t care for the writing style. So I’m going to skip N&SFF. 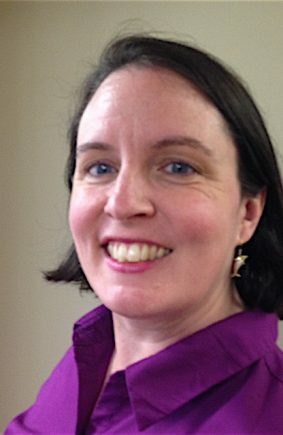 I’m hopeful that Elaine will continue writing JAFF — and it was a pleasure to “meet” you, Elaine! Wow, Opisica! That is quite a compliment! I’m glad you enjoyed it, and I hope you’ll give at least the movie version of North & South a fighting chance. Yes, the beginning is slow, and even brutal. But I promise it’s worth it in the end! Oh, that scene was just a shame. The book portrays Thornton nothing like that- in fact, he’s Mr Self Control. I’m sorry that scene soured you on Gaskell’s beautifully crafted story. Still, it’s never a bad thing to root for a little more P&P loveliness! First, I want to say I love your ‘Longbourn’ series. Glad to hear there will be more! I have added ‘Common Ground’ to my wishlist but first want to read North & South. Wives & Daughters is a favourite Gaskell book of mine and so is the movie adaptation. Thanks for the compliment on the Longbourn series! I can’t wait to finish it! We can’t leave poor Mr. Bennet hanging out there, can we? 🙂 I’m planning on reading/watching Wives & Daughters next, so I may have to hit you up with questions or comments!